The Holidays are meant to be a time for joy and relaxation. So it makes sense how we forget the many risks that the Holidays bring to our personal information! Whether you’re shopping online or in the stores, identity theft and fraud are something to watch out for. As consumers, we have a large target on our backs this season. We’re so busy running around trying to finish our lists, we forget about the basic steps we should be taking to protect our information. Hackers know this, so they take advantage of the season to attack. That’s why it’s important to know the precautions you should be taking to make sure your Holiday fun doesn’t turn sour. It makes sense to online shop on the go, especially if you have a lot going on during the Holidays! However, public Wi-Fi can be vulnerable and are known to be hackable. That’s not to say you can’t use it, just avoid entering credit card information while on it if at all possible. Your safest bet for online shopping is waiting until you’re at home, where the network setup is safe. Phishing and ransomware attacks intensify during the Holidays and threaten your security through email links. If the email seems a little fishy (get it? ), avoid clicking on it all together and Google the content of the email to see if it’s legit. For more on phishing and ransomware, refer to our post How to Prevent Ransomware and Keep Your Systems Safe. Support Scams refer to telephone fraud activities where scammers claim to be from a legit support service. The calls tend to peak around the Holidays, so it’s important you don’t give any information over the phone unless you are certain the person calling is who they say they are. If doubtful, call the number of the company listed on their website to verify. Skimmers are small devices that are installed around a legitimate card processing machine that can capture your card information. People get away with them because they are easy to set up and can blend in well. They are a threat all year round, so make sure you are examining the machine you’re swiping your card in. It takes 10 extra seconds to look over the machine, but those 10 seconds could save you in the end! Holiday Online shopping threats can decrease by locking down your login. Using Security Keys on your laptop or having strong passwords make all the difference in keeping your online experience secure. If you have any questions on what you can put in place, refer to our post How to Lock Down Your Login and Secure Your Information. 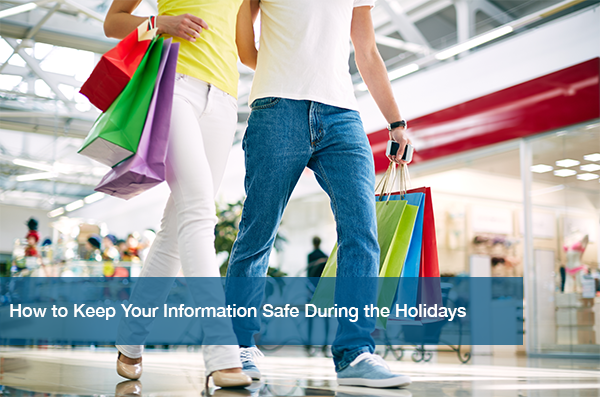 With so much on your plate already, you shouldn’t have to worry about keeping your information safe this season. But, it’s a necessary precaution. Don’t let hackers get the best of you and take the necessary steps to keep your Holidays wonderful! If you or your business are having problems with keeping your systems secure, ITC can help. Call us today at (512) 348-8324 for your free IT needs assessment.